Amateur astronomer John Wunderlin captured this video and still image of Asteroid 2007 TU24 as it passed by on January 29th, 2008. The elongated shape is due to the high speed of the asteroid and the comparatively long exposure times needed to record an object as dim as magnitude 10.3. Video of Asteroid 2007 TU24. 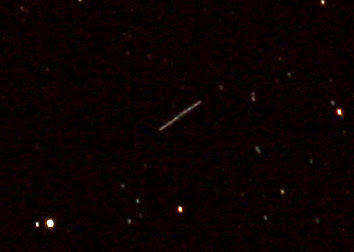 A still capture of Asteroid 2007 TU24. My Spouse And I Stumbled Over Here Coming From A Different Website And Thought I Might Check Things Out. I Like What I See So Now I'm Following You. read here Look Forward To Looking At Your Web Page Repeatedly. Many thanks with regard to discussing good info. I love your own publish as well as whatever you tell all of us is actually up-to-date as well as very educational. I'd like in order to save the actual web page and so I may come right here once again to see additionally you click here Cash Advance While you did an excellent work. Of the considerable number of rooms that comprise any home property, just an amazing couple of adds impressively to the general estimation of the said property. These zones, best kitchen remodeling contractor alluded to as "property hotspots" are so critical in property evaluations that land property assessors frequently makes basis that are vigorously in view of these rooms. Best articles that you sharing us. Its really helpful post. Visually Aroyi Tv comparisons chart provide some information about technological and using or buying smart TV in this modern era.